Melbourne is an artistic city. We've got the laneways, the street art, lots of small galleries and masses of hip folk . So it makes sense that a succession of local Government's have sought to celebrate the artistic nature of the place by funding various large, public art projects for us all to enjoy. That is, it makes sense until you look at some of the artworks themselves, which would have to be some of the fruitiest artifacts anyone has ever spent public money on. We are undoubtedly lucky to have elected representatives willing to make these chancy artistic choices on our behalf. What follows is a short celebration of this giddy public property. The result of an unlikely collaboration between a local artist, the Metal Workers Union and the City of Melbourne, Chris Reynolds' bizarre steel, concrete and bitumen construction sits obtusely on Russell Street in the CBD, waiting vainly for someone to explain its existence. It was funded as a result of a short lived project to try and strengthen the links between the manufacturing and artistic communities, although who thought this was important is now lost to history. 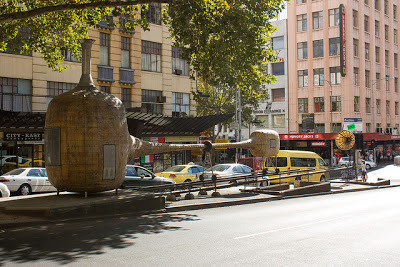 Also lost to history, Apparatus sits on the site of Melbourne's first underground toilets, now defunct (the entrance can still be seen at the Bourke Street end of the sculpture). Cow Up a Tree is fun to say, and this may be the best thing that can be said for it. 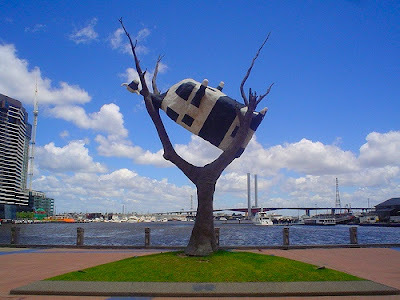 The bronze sculpture stands on the windswept frontage of Docklands Harbour in the East of the city, and its faux natural stylings provide an unintended ironic commentary on the manufactured landscape around it. Before finding a home in Docklands, Cow traveled the world and was displayed at a number of galleries and art festivals in Europe and America. 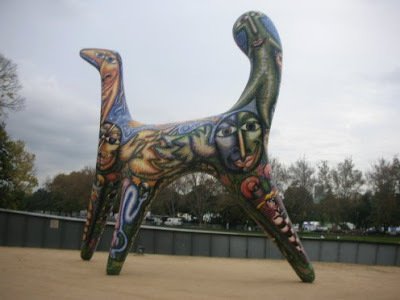 Having lived in the moat outside the National Gallery for 15 years, the mesh and tile Angel was moved to Birrarung Marr on the Yarra in 1999 by gallery trustees looking for a less flamboyant entryway. 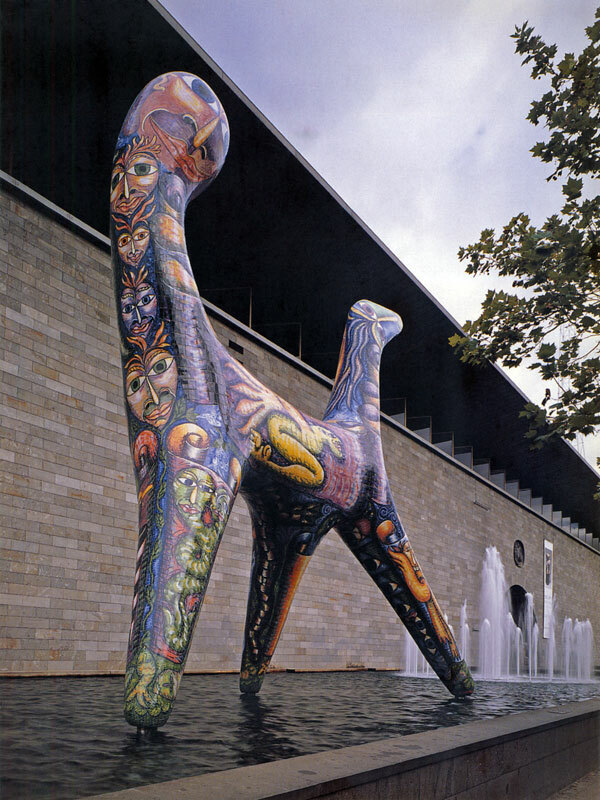 Inspired by the works of Picasso, Angel was commissioned to celebrate Australia's bicentenary and served as the logo for a campaign to promote Victorian tourism in 1996. It's proved a popular riverside feature, as indicated by the number of Flickr photos of it, and has even inspired some tribute artwork of its own. 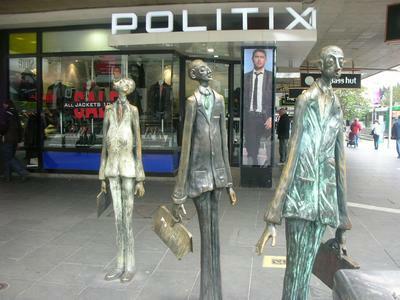 Commissioned as part of the same project that produced Fragment, this bronze sculpture on the edge of the Bourke Street Mall is actually titled Three Businessmen Who Brought Their Own Lunch: Batman, Swanston and Hoddle. And the artists intended it to live a sort of dual existence; on the one hand as caricatures of some of the cities founders, imagined as time travelers viewing the city they created far in the future, and also as anonymous business figures who are, in the words of Weaver, 'trapped in the perpetual motion of consumerism' (an interesting theme for a statue on the CBD's main shopping strip). Whatever the thematic considerations, the sheer oddness of it has proved a reliable draw for visiting tourists, who can often be seen hugging and holding hands with the statues, while having their pictures taken. 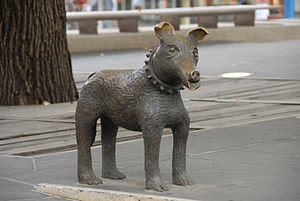 Another Melbourne City Council funded effort, Pamela Irving's bronze sculpture on the edge of City Square is a celebration of the prominent role of dogs in Australian life. Larry is a kind of every-dog, and so is not meant to depict any particular breed, his name a mixture of the artists uncle and the first Lieutenant Governor of Victoria (chosen, from what I can tell from my research, more or less at random). The statue has always been popular, so much so that it was stolen in August 1995. Despite a public campaign agitating for it's return, the original sculpture has never been recovered. A second Larry was cast in 1996 and more securely bolted to its display point. 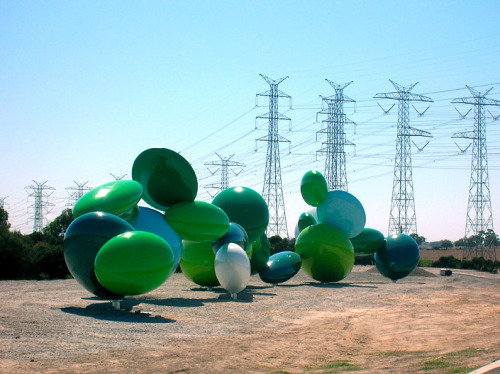 Note: The remaining public artworks are all taken from Melbourne's Eastern Freeway. 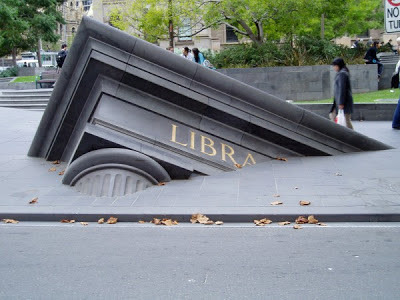 The Labor Government that oversaw the construction of this road embraced the idea of decorating it with public art so fully that it can almost serve as a kind of large, outdoor public gallery. The following artworks were estimated to have cost $5.5 million, making it the largest public art project in Australian history. c) $45 833. The number of spheroids divided by the total cost of this piece ($1.1 million). Something about the naming of this piece calls to mind the utilitarian naming practices of the Soviet bloc during the Cold War. Shops called 'Shop.' Meat products called 'Meat.' Cigarettes called 'Cigarettes'... And a giant, weird bird looking to eat a squiggly yellow thing called 'Public Art Strategy.' The kind of wastleand area this stands on, near Cheltenham Road, seems somehow fitting. "Hotel appears as a piece of roadside architecture, only there are no other buildings for miles and you can't get in." 'What do you think that is?' he asked me. There was silence in the car for a while while we stared at it... then we looked away and talked about something else. I see no image for "Desiring Machine" but there is a link to a British site that still yields no image. Back when "Angel" was in the moat, Billy Connolly showed it in one of his docos and introduced it in words something like "... my favourite thing ever ..."
There's a much bigger dog statue at the corner of Wingrove and Station streets near Fairfield railway station. 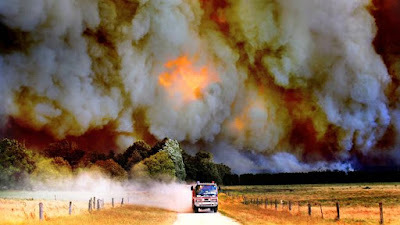 If only people could climb inside, (via a ladder in a leg), and look out the head and maybe ... other places; but it doesn't even provide effective rain shelter. Apparently if it was useful it wouldn't be *ART*, "merely" craft. That would be a waste of ratepayers' money, wouldn't it? I wonder what these glorious pieces of art cost? Thank you for putting them altogether on your blog. Very interesting.